These logic number puzzles help students develop strong number sense as they work, clue by clue, to identify the digits of the missing number. The mixed-skills clues incorporate even-odd, less than-greater than, operations (sum, difference), multiples of 5 and 10, geometric terms (octagon, pentagon, hexagon, quadrilateral, trapezoid, parallelogram), money (quarters, nickels) and measurement (cup, pint, quart, gallon). Students must squeeze every bit of knowledge from each clue to eliminate possible digits until they finally identify the missing digits. Strategy: Students may solve these problems in many ways, but this organized approach is most effective and easily replicated by students in the future. Students should also feel free to consult math texts, math word walls, etc. for help with measurement clues, geometric terms, etc., as needed. Students use an organized approach to solving these place value logic number puzzles. Students begin with 0-9 as possible digits for each place value. Each clue allows them to eliminate some of those possibilities. The process continues until there is only one possible digit for each place value. As a final step, students check their work. As each clue is read, students give a thumbs up if the clue fits their number or a thumbs down if it doesn't. This last step provides immediate feedback to students on the correctness of their reasoning. Check out the new Mathwire Problem Solving: Logic Number Puzzles collection which includes links to previous Mathwire logic number problem collections. Standards/Objectives: The Fall 2008 collection is organized by Standards/Objectives to make it easier for teachers to coordinate activities to match current units of learning. Here are some suggestions for including seasonal themes in your regular mathematical lessons. Check out the Mathwire Fall 2008 Math Activities collection. In the Contig Game students toss three dice. They use those three numbers and any operations to form a number on the game mat. 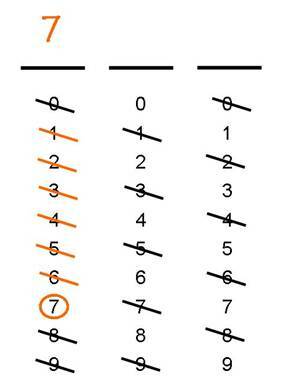 Players earn an extra point for each covered number the new number touches, so students quickly learn to search for the best move that will yield the maximum possible points. The instructional benefit of the game is that students try many different combinations in search of that best move. The Contig game encourages students to develop fact fluency and strong number sense as they search for the perfect move to garner the most points each turn. 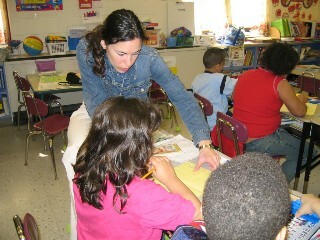 It is also an effective venue for a math challenge in the classroom or across grade levels. 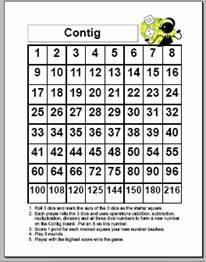 Consider adding a Contig Tournament to reward fact fluency and strong number sense. Check out this Contig resource for alternate playing rules and discussion questions. Teachers who regularly use math templates, whiteboards and/or journal writing include planned task items that assess student proficiency. Careful observation of student responses allows teachers to form flexible small groups for additional instruction or enrichment and also better plan for instruction. Classroom Management: Use a class checklist to quickly record who gets it [mastery], needs a little more help [developing], or needs reteaching and/or a different approach [beginning]. Using this checklist throughout the lesson and guided practice allows teachers to create flexible groups for each new skill/concept/strategy. Teachers need to regularly plan 3 levels of activities to meet these identified needs. This practice maximizes class time to best address the varied levels and learning styles of individual learners in the class. Teachers need resources to challenge better math students. Encourage these students to create original problems similar to problems done in class. This practice is effective because the open-ended nature of the task moves students to higher levels of Bloom's Taxonomy. They must analyze the current problems to identify the salient skill/strategy, then synthesize these skills/strategies by creating original problems that are similar. 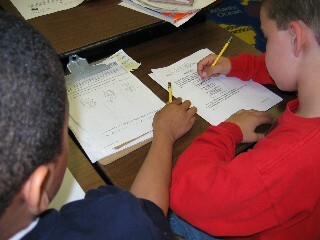 Finally, students evaluate their own work and that of classmates as they peer-solve and critique these original works. Publish student work with their name and the year of publication. Assemble these collections in the math center and begin to include these original problems in instruction and in problem solving activities. Students are strongly motivated to solve problems created by their peers.